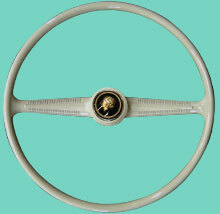 FLAT4 Formula steering wheel is the reproduction of the famous SPEEDWELL steering wheel of 70's. 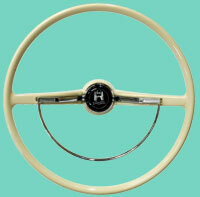 FLAT4 Formula steering wheel is made of mahogany wood and fully polished slotted spokes. FLAT4 has proven once again the commitment to high quality and product integrity. 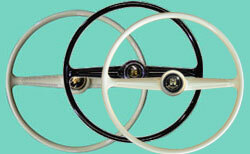 Like the original, the FLAT4 Formula steering wheel is 374mm (14"-3/4) diameter. Other than the horn button says FLAT4 GT, this steering wheel is just like the original. 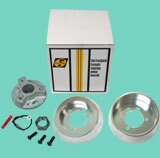 Matching boss kit (Hub adapter) is available in 3 different splines to fit any VW. 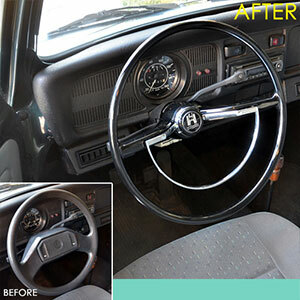 FLAT4 FORMULA STEERING WHEEL 14-3/4"
FLAT4 GT wood steering wheel become today's standard on high quality Cal-look VW just like the original EMPI on from 70's.FLAT4 GT steering wheel is made of one piece mahogany wood and fully polished spokes. 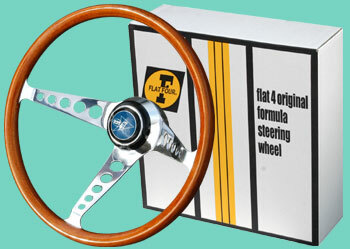 FLAT4 GT wood steering wheel is 400mm (15"-1/2) diameter. 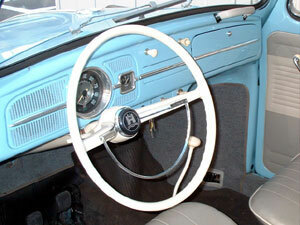 Other than the horn button says FLAT4, this steering wheel is just like the original old EMPI steering wheel. 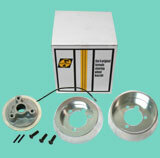 Matching boss kit (Hub adapter) is fully polished billet aluminum and available in 3 different splines to fit any VW. FLAT4 also has WOLFSBURG horn button as a replacement parts. By only replacing from a sporty look of FLAT4 GT logo to the WOLFSBURG logo, your steering will instantly become a looks of luxuary 60's optional steering wheel. 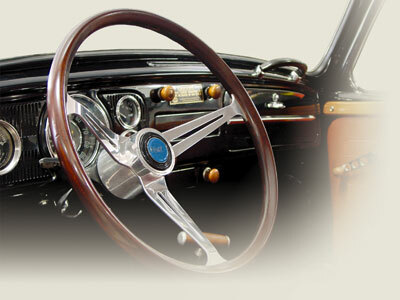 FLAT4 GT WOOD STEERING WHEEL 15-1/2"
*FLAT4 Banjo steering wheel is not designed to use on TYPE-2. 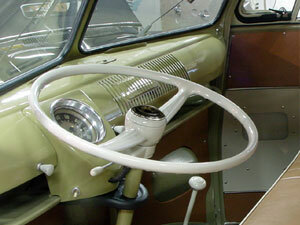 We are not responsible for any accident or trouble by using our Banjo steering wheel on TYPE-2. FLAT4 BANJO STEERING WHEEL "IVORY" 15-1/2"
FLAT4 BANJO STEERING WHEEL "BLACK" 15-1/2"
FLAT4 BANJO STEERING WHEEL BOSS KIT '74-'79 & MEX. 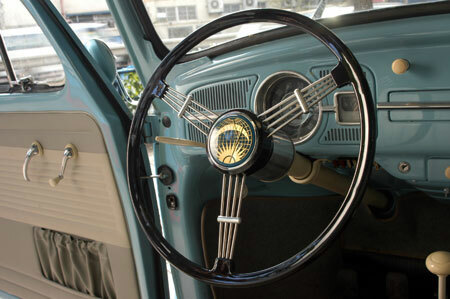 FLAT4 vintage horn buttons are reproduction of accessories from 50's and specially"Golden lady"a.k.a. "Greek lady" is known as one of the Rarest of rare items among vintage enthusiasts, and also the rare "SAN & MOON" is konwn to be seen with Rometsch and EMPI Formular steering. These horn buttons are often associated with Porsche 356A, Rometsch, Hebmuller, Dannenhauer & Stauss, and other high class coachbuilder. 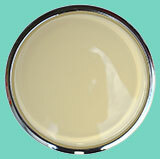 We also produced "St. CHRISTOPHER" horn button to join our line of horn buttons. All these horn buttons are made as well to fit not only FLAT4 banjo steering but original PETORI steering wheel, and quality of workmanship is there to compete with originals. FLAT4 FLAT4 VINTAGE HORN BUTTON "GOLDEN LADY"
FLAT4 FLAT4 VINTAGE HORN BUTTON "SUN & MOON"
FLAT4 FLAT4 VINTAGE HORN BUTTON "St.CHRISTOPHER"
Genuine VW style steering wheel is now made by FLAT4. 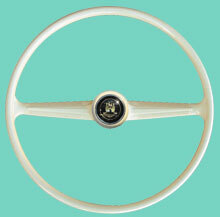 These steering wheels are exactly same as genuine VW steering wheel in every detail.TYPE-1 '60-'71 / TYPE-3 '61-'71 steering wheels are available in silverbeige, graphite black and Ivory. Then we now also offer one to install on 'Mexican Beetle and ’74-ON Standard model (One originally come with 2 spoke steering wheel). All these FLAT4 steering wheel is high in quality. 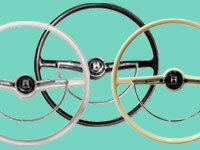 TYPE-2 '55-'67 steering wheels are available in white grey and black.These FLAT4 steering wheel is high in quality.FLAT4 produce all new Genuine VW type horn buttons are available as well.FLAT4 horn button is perfect in every detail even the gold wolfsburg sign of the button lense is perfect.It is available in Ivory and Black and White Grey. 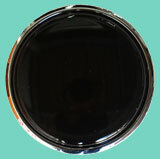 GENUINE VW STYLE STEERING WHEEL 17-1/2"
GENUINE VW STYLE HORN BUTTON "IVORY"
GENUINE VW STYLE HORN BUTTON "BLACK"
GENUINE VW STYLE HORN BUTTON "WHITE GREY"
FLAT4 GT HORN BUTTON "BLACK"
FLAT4 original interior accessory parts made from wood style material to suit your TYPE-1,K.Ghia,TYPE-3. These high quality interior accessories are only available from FLAT4. FLAT4 wood window crank handles are to give you 70's looks. Wood is used for the buffer and knob of the window crank. FLAT4 wood door lock knob for 1967 and later are easily installed by taking off the original knobs. 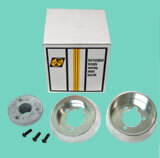 FLAT4 wood side brake sleeve is designed for easy handling. 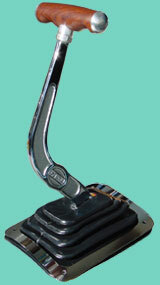 It is supplied with chromed release button as sold by 70's EMPI's side brake sleeve. FLAT4 WOOD STYLE WINDOW CRANK HANDLE TO-'67 Pr. FLAT4 WOOD STYLE WINDOW CRANK HANDLE '68-ON Pr. FLAT4 WOOD STYLE INNER DOOR HANDLE TO-'66 Pr. 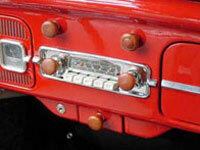 FLAT4 WOOD STYLE RADIO KNOB '67-ON Pr. FLAT4 WOOD STYLE DOOR LOCK KNOB '67-ON Pr. 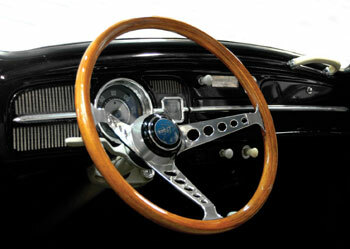 FLAT4 original wood shift knobs give you a perfect feeling of shift change. It is made to fit both 7mm/12mm threds. It is available in FLAT4 GT logo and WOLFSBURG logo. FLAT4 original wood Round shift knob especially made to replace original plastic ball knob of the "HURST" type shifter and also made to fit on our original "FLAT4 ELIMINATOR SHIFTER". 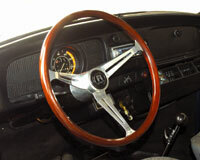 So now you can cordinate your interior with FLAT4 original wood interior items even if you have "HURST" type shifter. FLAT4 WOOD STYLE SHIFT KNOB "FLAT4 GT LOGO"
FLAT4 WOOD STYLE SHIFT KNOB "WOLFSBURG LOGO"
*Wooden part of this product is using Guibourtia demeusii(Bubinga). Here is the reproduction of the glove box from FLAT4.The Right Handle Drive version for TYPE-1 '58-ON is made of F.R.P..Please use as a replacement or for the complete restoration. 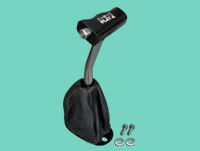 Produced by CSP Germany, these are the highest quality shifter of the world. These T-handle shifter are 40% shorter stroke than stock shifters and they can give more speedy and smooth shift feeling. Push button to reverse gear makes no mistake when you change the gears. The knob is black anodized with FLAT4 logo.Available in L.H.D. and R.H.D. version!! FLAT4 Eliminator shifter is a reproduction of shifter originally released by EMPI in early 70's untill company close it's door in '74. 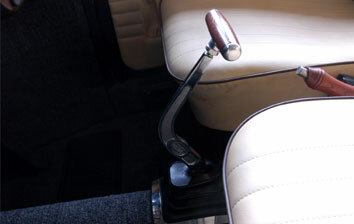 This short lived original shifter is now sold at a premium. 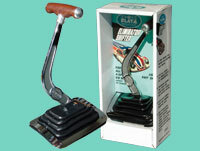 FLAT4's new eliminator shifter is made of chromed heavy duty steel shift lever and "T" shaped wood shifter handle. 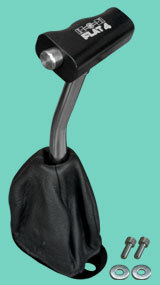 This shifter is designed to give you 30% shorter stroke than stock VW shifter for fast and positive shift change. The shifter will come in a package looked like original 70's package with an instruction. 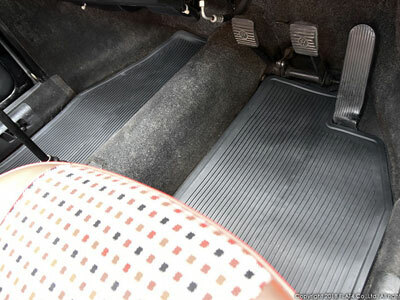 Replacement shift boots and "T" handle is available and now there is FLAT4 wood round shift knob to change its image also. 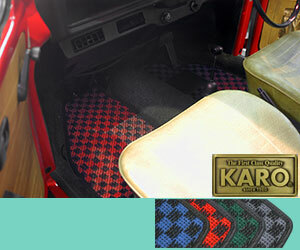 FLAT4 made new style floor mat for air cooled VW and PORSCHE 356 cooperate with "KARO" known as Japan's no.1 floor mat brand.These are all made in Japan and use high grade natural material "sisal-agave". 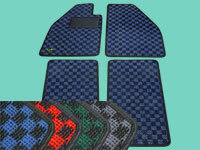 FLAT4 HIGH QUALITY FLOOR MAT SET L.H.D./R.H.D. 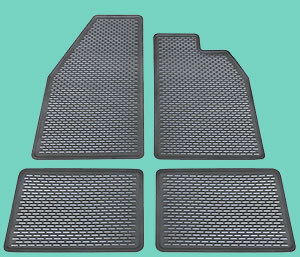 FLAT4 made this new Right Hand Drive rubber mat in 2 different style. IN-630A having vertical stripe like original factory style and IN-630B having horizontal dot stripes which was originally offer in Japanese VW dealer back in the days. 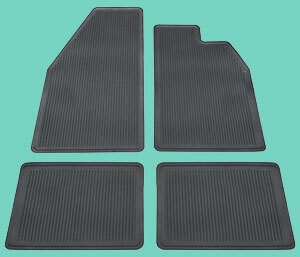 These rubber mat shape is exact copy of RHD rubber mat offered in VW dealer in Japan and front is just place on the floor for perfect fit and rear mat can be cut to the seat rail shape of your car. 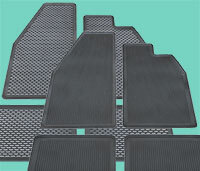 FLAT4 FLOOR RUBBER MAT SET "LONG RIB"
FLAT4 FLOOR RUBBER MAT SET "SHORT RIB"